We offer LTI 1.0 integration for My BrainPOP account provisioning and embedding BrainPOP topics into course materials. 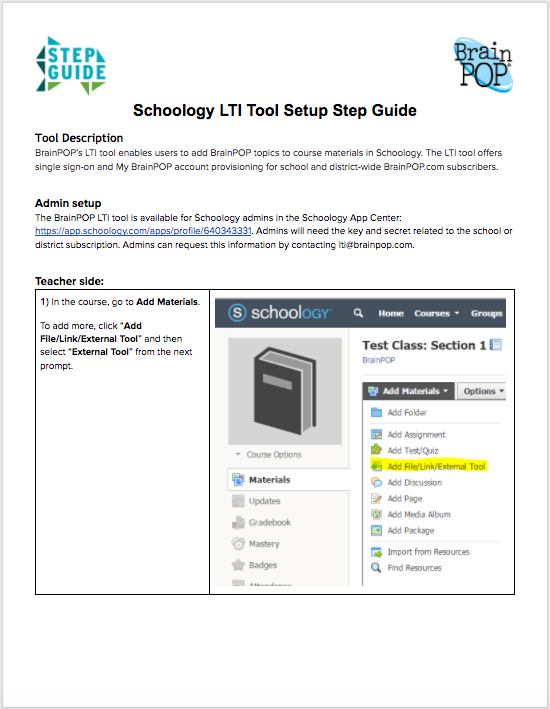 This is available for school- and district-wide subscribers using a Learning Management System that supports LTI. BrainPOP LTI apps are available in the eduappcenter and the Schoology App Center. Subscription administrators may contact lti@brainpop.com for their subscription key and secret. Check out the following support resources to help you get your school up and running with My BrainPOP.